Welcome! Heart and Wisdom Birth has recently undergone some very exciting changes. In December 2016, I teamed up with Fredericton Maternity. This means we will work together, we can take on more clients, offer more services AND our clients will benefit from our combined knowledge and expertise. Welcome! My name is Kat Garduno-Roberts. I am the founder of Heart and Wisdom Birth. My husband and I have four amazing kiddos. In 2012 we moved from Halifax to Fredericton and are excited to build our life here! Ever since I can remember I wanted to be a Mother. As a small child I would play I was pregnant and that I gave birth. I am fascinated and truly awed by the miracle of pregnancy and birth. My education background has been focused on health and well-being. I have a BSc. in Psychology and a Master's Degree in Health Promotion. I am also a certified Life Coach and have been working as a Personal Well-Being and Parenting Coach for some time. In my work as a Coach I was finding clients often sought me out to help them with issues revolving around making decisions and dealing with concerns about parenting, pregnancy and birth. 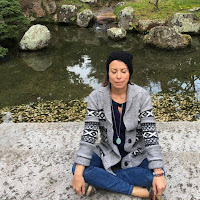 Though I loved working as a Coach, I was finding that naturally I am was being pulled towards the realm of working more in the birth community. Deep down I've always known I would one day add to my role as a Life Coach by working in the birth community, but I was waiting for the right time. And that time came in November of 2011 when I began my journey as a Birth Doula. Since then I have been very fortunate to work with so many wonderful couples, and I look forward to what lies ahead. The births of my 4 children, have all been exciting, intense, have had their share of the "unknown" yet also empowering in their own way. I have learned so much from each one and my respect for the wisdom of our bodies and the birth process has grown even more. I believe that labour and birth are truly an amazing and wise process and every woman should be given the chance to trust her heart and the wisdom of her body in order to birth her baby, in whatever way feels right for her. Throughout my birth experiences the presence of a supportive, caring and knowledgeable doula who knew me and my desires, my fears and my birthing goals was instrumental in helping me get through labour as well as the post-partum recovery. I want to help mothers to feel that same support I experienced during my births. I am very passionate about serving the birth community and being part of the movement to make labour and birth an empowering experience for women. I am trained as a Birth Doula through CAPPA Canada. I have pursued further training from MotherWit Doula Training, am a Certified Doula with ProDoula and have attended several educational birth conferences. The most recent one being the Birth and Beyond Conference in 2015, where I presented a talk on VBAC. I also attended the same conference in 2013, and had the pleasure of meeting and talking with Ina May Gaskin and other amazing birth gurus. In 2017 I trained with GentleBirth and became a Certified Instructor. The GentleBirth philosophy is something I had always resonated with and I am so excited to be able to offer these amazing workshops in my community. GentleBirth uses meditation, sports psychology and other brain training techniques in addition to everything you need to know about giving birth to help you prepare for your most positive birth possible. Thank You for taking the time to read my story. I hope it has given you a better understanding of my background. Please contact me if you have any questions.